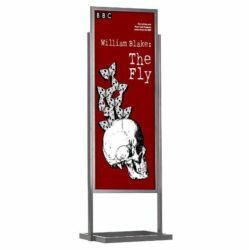 18 x 24 Poster Stand for Floor, Top Insert, Double Sided, Holds 4 Graphics – Silver If you have a couple of different inserts to be displayed on one stand, at the same time due to the lack of limited floor space. Then this aluminum poster stand is a great solution for you. 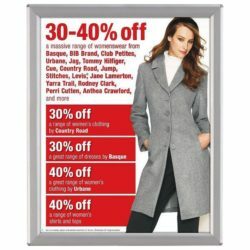 This poster frame stand is a very sturdy product to be used in high traffic public areas. Yet it is very stylish thanks to it’s grooved profiles. 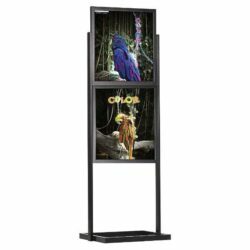 This aluminum poster stand can hold 4 different 18″ x 24″ size posters at the same time. Each frame has a plastic middle support panel that prevent the poster getting wrinkled inside the frame. 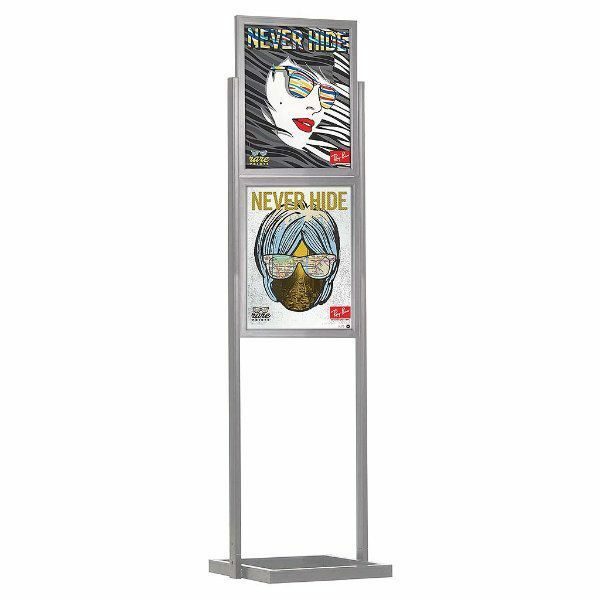 Another feature of this poster stand is, plastic non-glare lenses for each poster. The open-top design allows for quick and easy update. To change, simply place the 18″ x 24″ prints between the middle support and the non-glare protective lenses, then slide down through the channels, on the top sections of each frame. 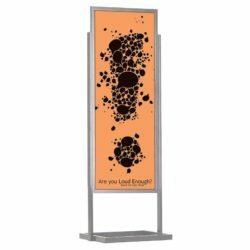 If you need the same aluminum poster stand in black, please visit our Eco Floor Poster Stand category. I was considering going with a different model, but am glad I went with this. My boards fit perfectly into them and it’s sturdy. We use this for signage in our office and we also use this for trade shows. Seems to be good quality and it arrived faster than expected.